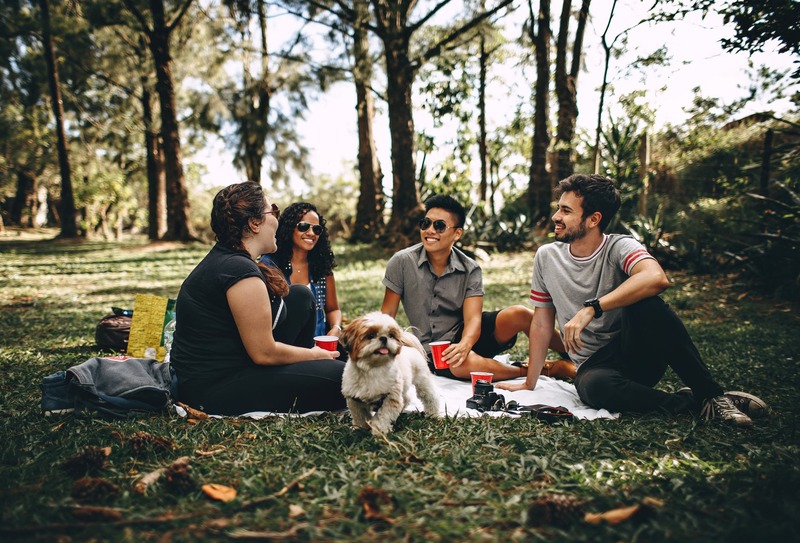 Whether it’s an annual event planned weeks in advance or an impulsive adventure with wine and pizza gathered on the way, picnics are one of summer’s greatest pleasures, and the city is filled with possibilities in the form of parks and gardens. New York City is also known for its accessible secrets, and our short list of urban escapes–whether hidden in plain sight or tucked away–are great to visit any time, but as off-the-beaten path picnic spots they shine. One of the three woodlands (with the Ramble and North Woods), this section is often referred to as Central Park’s “secret garden.” It was closed off to the public by then-commissioner Robert Moses in the 1930s for use as a bird sanctuary. As a result, it remained largely untouched until 2001 when the lush four-acre peninsula was reclaimed and tended by the Central Park Conservancy as part of their Woodlands Initiative. The area continues to be a refuge for wildlife, but it’s also a newly-discovered favorite for park visitors seeking a peaceful haven. While the sanctuary is still fenced off, a rustic gate now marks the entrance to new pathways. The Hallett Nature Sanctuary is open daily from 10:00 A.M. until just before sunset; get directions here. The Heather Garden at Fort Tryon Park; image via Wikimedia Commons. Fort Tryon Park in upper Manhattan extends from 192nd Street and Fort Washington Avenue north to Riverside Drive near 200th Street. Located about 10 minutes from the Cloisters, this lesser-known city escape, designed by the Olmsted Brothers in 1935 for John D. Rockefeller, Jr., is abloom in season with jasmine, hellabores, daffodils and more and features one of the largest heather collections in the country. The three-acre garden is also filled with trees, shrubs, and perennials for a botanical diversity that attracts birds, butterflies, and other beneficial wildlife. Perched on a series of slopes more than 200 feet above the Hudson River, the Heather Garden offers stunning views, making it one of the city’s many enchanting spots to enjoy a picnic. Download a map and guide here. Gardens at the Church of Saint Luke in the Fields; image: Maro Riofrancos via Flickr. Built in 1821, the Church of Saint Luke in the Fields occupies a two-acre West Village block, with a series of gardens hidden behind high brick walls. Inside you’ll find the more formal Barrow Street Garden and the older Rectory Garden with wrought iron tables and chairs and an impressive rose garden. You can see the ruins of the old parish, which burned in a fire in 1981, as you wander the paths or take shelter in the garden’s quiet nooks and green spaces. Hours: Mon – Sat 10 A.M. – Dusk; Sundays 10 A.M. – 6:30 P.M.
Chinese Scholar’s Garden, Staten Island Botanical Garden, Snug Harbor; image: Kristine Paulus via Flickr. The New York Chinese Scholar’s Garden in Staten Island’s Snug Harbor Cultural Center and Botanical Garden is one of two authentic scholar’s gardens in the United States and serves as a setting for a variety of multi-cultural events. The garden features magnificent rock sculptures resembling the mountains that inspired the poetry and paintings of Confucian, Buddhist and Taoist monks and other scholars. Visitors can explore eight pavilions, a bamboo forest path, waterfalls, a koi pond, Chinese calligraphy and a variety of Ghongshi scholar’s rocks including a 15-foot formation that towers over the central courtyard. Summer hours: Open April 3 – November 4, open Tuesday – Sunday, 10 A.M. – 5 P.M.
Valentino Pier; image courtesy of NYC Parks. 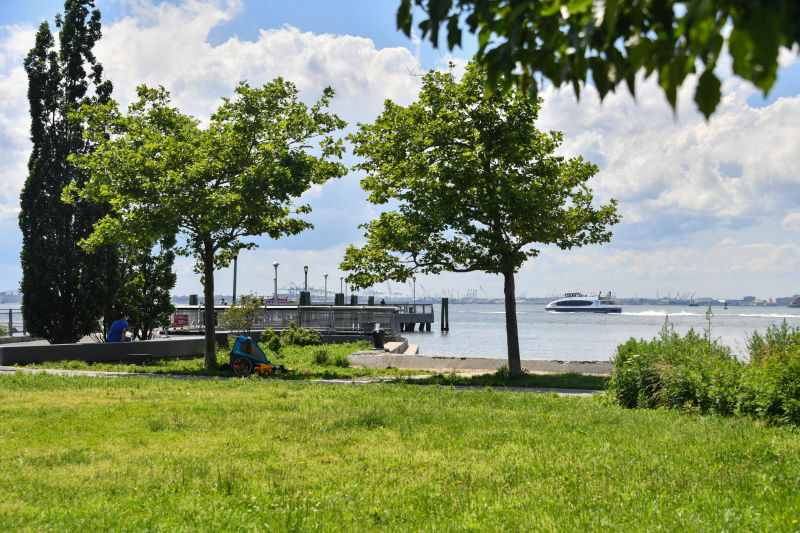 The Louis Valentino, Jr. Park and Pier is one of those urban gems that’s perfect just the way it is: A small beach area and benches along the pier offer big views of the Statue of Liberty, Governor’s Island, the Manhattan skyline, Staten Island and the New York Harbor. Well-tended green space adjacent the pier is perfect for picnics. Not all of the city’s lush, green picnic picks are outdoors. If you’re in need of a rainy-day alternative–and it’s a weekday between 10 A.M. and 4 P.M. when this privately-owned public space is open–you can enjoy lunch in a tropical garden paradise encased in a 10-story glass atrium. Ferns and hanging vines drape from the building’s girders and the scent of gardenias and the sound of water filling a pool hidden amid a cluster of trees fill the air. The building’s glass walls create a temperate environment ideal for the atrium’s subtropical garden while creating a seamless flow of green space between the atrium and Tudor City Park to the east. Elevated Acre at 55 Water Street. 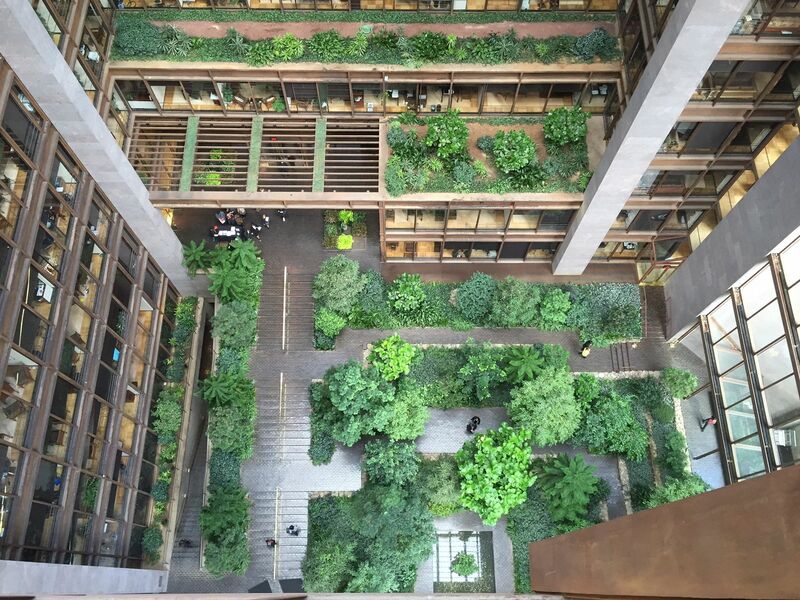 Another deeply urban garden paradise–this one tucked into one of the city’s most dense concrete canyons–this public space in Lower Manhattan’s Financial District is a popular lunch spot for employees of the surrounding towers. Located three stories above the street up a “hidden” escalator, this full-acre park between two towers offers a seven-tiered amphitheater surrounding a green lawn and a Brazilian hardwood boardwalk 30 feet above the East River for spectacular open city and river views and sunsets. Image courtesy of 6BC Community Garden. No list of lesser-known picnic spots would be complete without mention of the magical East Village gardens. Of these, the Creative Little Garden may not be the best-known but it may be the most enchanting. This elegant shade garden first got its lease in 1978. Long and narrow, it winds around a gravel path, rock garden, flagstone patio and many seating areas. Quiet evening concerts happen on the regular, but it’s always possible to find a nook to hide in. This Alphabet City community garden is one of the neighborhood’s larger public gardens, and it’s a joy to discover its secret spaces just steps from the bustling East Village scene. 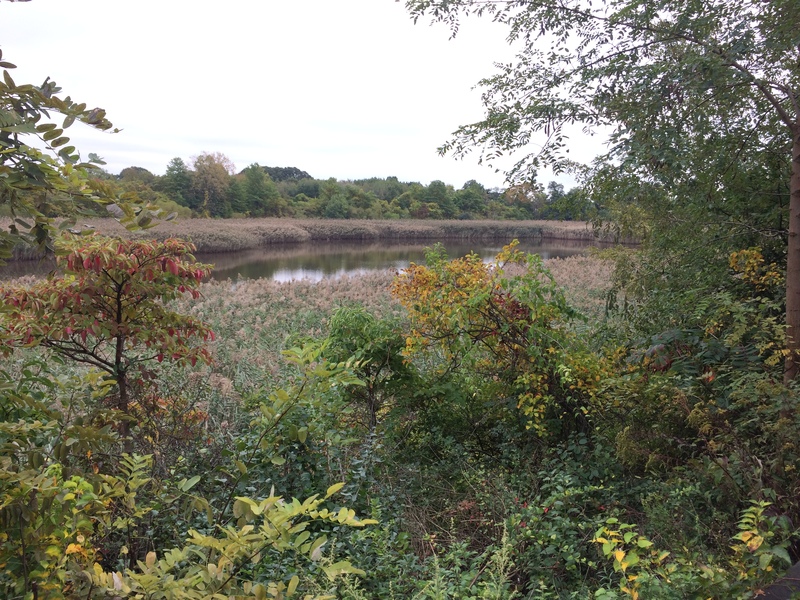 Highland Park and the 50+ acre Reservoir sit atop the Harbor Hill Moraine, an ice-age-formed ridge, which means you get dramatic views of nearby cemeteries, East New York, Woodhaven, the Rockaways and the Atlantic Ocean. The famous Olmsted brothers designed the main drive and concourse on the southern portion of the Reservoir, which operated as a water supply for Brooklyn from 1858 to 1959. It is divided into three basins separated and enclosed by steep stone walls. The outer basins were drained decades ago; what you’ll find is the way nature overtakes a landscaped space if given the chance: The combination of forests, fields, and wetlands make this a uniquely ideal spot wildlife viewing. 127 bird species were recorded on its grounds along with opossum, raccoon, squirrels, voles, snapping turtles, garter snakes, and frogs.